Since you’ve blocked me from commenting on your page (and on this post, in particular), this seems the best way to respond to you. After all, at least some of you do follow Sciblogs. I have to say that preventing someone from commenting is particularly rich coming from a group who claim that they want to have a ‘debate’ about community water fluoridation. Apparently the other party isn’t allowed to bring science, evidence, or critical thinking to the table: did I make the echo chamber uncomfortable? In fact, it’s downright hypocriticalA, since those of you behind the group name know that you are able to comment freely on pages such as Making Sense of Fluoride, or on the blogs hosted by sciblogs.co.nz. In other words, you can talk at my place, but I can’t talk at yours. That doesn’t seem particularly fair. And by the way, do you know how silly you look when you then go back and delete the commentsB by the individual you’ve just barred from commenting? (Readers will notice that there’s no ‘reply’ option in these screenshots.) Particularly when you’ve just asked them a question. Could it be that you didn’t really want to hear the answer? Now, since I’m unable to provide you, Rethink Fluoride with the answer you so keenly sought, on your actual page, I’ll do it here. (I’m surprised you couldn’t find it, given that you’ve cited the actual paper & claim to have read it). This sort of behaviour – blocking people, deleting comments, avoiding discussion – isn’t the sort of thing I’d expect of a group who are keen to have their views taken seriously. However, along with a tendency to accuse those they oppose of lying, and of resorting to personal insults when all else fails, it is the sort of behaviour often associated with those who promote a range of conspiracy theories. You don’t think so? Yet, those who oppose community water fluoridation will happily complain that “the government” (and its various agencies) are “covering up” evidence of harm; that fluoride is used to “dumb down the population”; that organisations such as WaterNZ are simply lobby groups & that thus the information they provide can’t be trusted. In acting this way, Rethink Fluoride, you have a lot in common with groups such as those opposed to vaccinations and to the use of 1080. This is not something to be proud of. A There’s also a certain amount of hypocrisy in claiming that fluoride is the source of all ills and then to applaud a dental health initiative that uses fluoride toothpaste and fluoride tooth varnish. B Others do notice. I suspect that Gold may find his comments also disappear reasonably quickly. Mind you, we’ll be in good company, given that Rethink Fluoride first asked Ken Perrott if he’d debate Paul Connett on the issue, and subsequently (& farcically) not only withdrew the invitation but also deleted the entire thread. How fortunate that Ken took screenshots! What really stands out in this tirade is that the writer doesn’t seem to get the difference between enforced mass medication of fluoride and administering it topically on the teeth. It seems far less harmful to place it on teeth topically (if you must use it) than ingesting it. Additionally, it protects the basic human rights of an individual to be able to decide what medication they take, rather than the state. Slurring genuine New Zealanders who study issues for themselves (no matter if it is 1080, vaccines, or fluoride) is really not the answer, and not a good look. I’m not surprised that the Rethink Fluoride site banned you, as going by this post you’re seeking argument rather than knowledge. It is, perhaps, unfortunate that RF saw fit to delete my comments on their page, as you would then be able to gain a more balanced impression of the original interchange. In summary – I challenged another commenter who named a scientist and described him as a liar: this is an actionable statement & I asked for supporting evidence. To use your phrase, I sought knowledge. No actual evidence was forthcoming. I pointed out the emotive use of “industrial waste” to describe HFSA, noting that there are actually standards in NZ that regulate its quality. RF said I was wrong. I provided the relevant document. RF claimed that those standards aren’t enforced; page 12 of the document contradicted that. At that point my comments (& the RF responses to that particular sequence) were summarily deleted; this meant I could not respond to their other questions. Are you seriously saying, Harriet, that they don’t look rather silly for behaving in this way? I notice that you haven’t actually responded to any of the points I’ve made in my post. Yes it gets rather tiresome when fluoride supporters use false analogies (eg fluoride toothpaste and varnish). They don’t see that it is a self defeating argument. There is definitely evidence of harm which has not been forthcoming from the authorities . The most comprehensive report on fluoride toxicity is that released in 2006 by the United States National Research Council (NRC) listed a number of studies showing side effects. This report represents more than two years of work by a team of the world’s foremost experts on fluoride toxicity, who reviewed hundreds of studies, and carefully examined their significance. eg Feltman & Kosel (1961) used tablets with about 1 milligram of fluoride swallowed, chewed or dissolved in drinking water, which corresponds to the amount of fluoride in 1 litre of water fluoridated at 1 mg/L. This study found that a range of symptoms occurred in about 1% of the patients. The study used controls and was blinded, to rigorously establish that the reaction was to the fluoride. Grimbergen (1974) selected patients who reported gastrointestinal symptoms on consumption of fluoridated water. Water fluoridated at 1 mg/L was used, as well as distilled water as a control. The study was double blinded, so neither the patients nor the physician knew which water was fluoridated until after the experiment was completed. This experiment established that the fluoridated water caused the symptoms. Identified fluoride as a mineral that can positively influence human health, and although earlier NRC reports were not conclusive in their opinions, this report concluded that fluoride was considered to be an element essential for human life based on its role in cellular functions involving metabolic or biochemical processes. 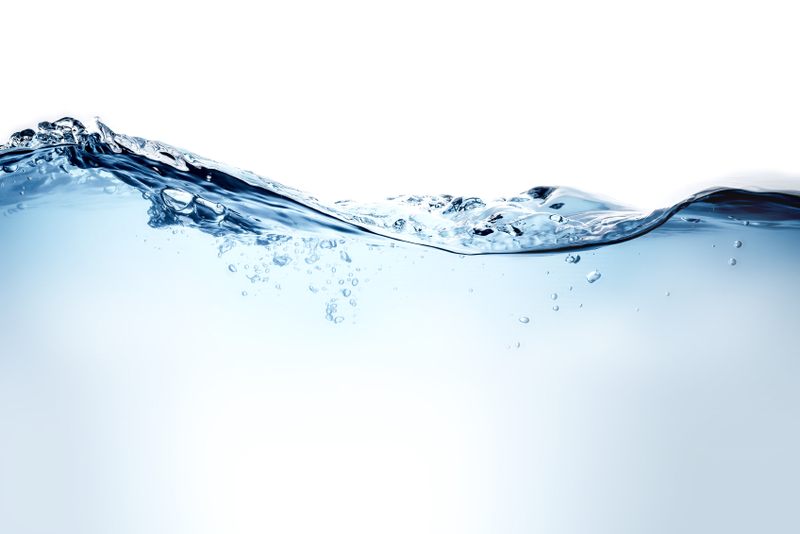 The report further stated that fluoride in drinking water has two beneficial effects: preventing tooth decay (dental caries) and contributing to bone mineralization and bone matrix integrity. Valid scientific evidence doesn’t go out of date. Whatever overall conclusion was reached it doesn’t negate the findings nor invalidate that of the individual studies. The conclusion you have stated on the report (if correct) is baffling given that there were many other studies showing adverse effects at low levels. Most of the research recommendations in the 2006 report haven’t been done yet so I’m not sure what you are referring to in 2007? I couldn’t find that. Some excerpts form the NRC report. It’s interesting that one of the side effects Feltamn and Kosel found was headaches and neurological problems which gives plausibility and triangulation to the recent studies showing IQ drop from fluoride. Gus, the study of Feltman & Kosel (1961) does not provide any evidence for your claim. The possibility of side effects in 1% of patients getting therapy is mentioned by there is no data presented for this. I would hope peer reviewers these days would demand that authors provide evidence for such claims. They certainly have done this when I have made speculative claims in my papers – and data or evidence always improves a paper. Grimbergen (1974) is a very weak document with nor precise measurements. It comes across as someone working in their kitchen. Not at all convincing – it should never have been published and a reputable journal would not have done so. I would have thought if one is to argue for harmful effects from fluoridation one would cite far better and far more recent literature. Gus, something you must realise about the 2006 NRC report is that it investigated all sorts of published reports and speculation so as to make a recommendation on lowering the recommended maximum level of fluoride in water from 4 mg/L. In doing so it of course was required to note the research at higher levels of dietary intake and speculation but it is important to note that the only basis used for recommending decreasing the maximum level was the prevalence of serious forms of dental fluorosis and skeletal fluorosis. That was the sole criteria they decided on after reviewing all the literature. Of course, many of the recommendations have since been researched. Notably, research in NZ, Canada and Sweden have shown that the extrapolation of IQ effects from areas of endemic fluorosis in China is unwarranted. That in fact, no cognitive harm results from community water fluoridation. More definitive work has been done with animal models, reported recently. Not the old “endocrine function” argument> With millions of woman taking a real “Endocrine Disruptor” every day,.maybe you should look at them to stop doing it, if it is such a danger from the birth control pill. Perrot makes the following remarkable claim “Gus, the study of Feltman & Kosel (1961) does not provide any evidence for your claim.” Actually it does unless you deny any evidence that doesn’t suit your own preconceived ideas. It’s called cognitive dissonance. Look it up. chris uses another false analogy of the birth control pill !!! Ken quotes an animal model ! remember Thalidomide. They’d done animal testing and we know how that turned out in humans. Most people would consider it alarming that an unnecessary medical treatment is being forced on them via the water supply, when researchers back in 2012 were saying it causes neurological damage. Since 2012 there have been another twenty odd published human studies, making a total of 53 out of 60 that show harm to the brain. One of the latest is the extremely well conducted Bashash et al study from September last year that found children exposed in utero, to the same levels of fluoride as New Zealand children, had lowered IQ. This study looked at the fluoride levels in the urine of the pregnant women which gives us the level of exposure at an individual level. The only New Zealand study to look at this, found NZ women had exactly the same levels of fluoride. Again, most people would be alarmed if they knew this. It is hugely hypocritical that Alison Campbell, as a proponent of fluoridation would accuse those of us opposed to it as being “unfair”. Forcing a medical treatment onto others is what is unfair. I find it hard to fathom that why anyone thinks they have the right to force a medication onto others and other people’s children without their informed consent. Surely, even basic respect for others would make this completely unthinkable for most people. What is most important for me personally is freedom of choice, regardless of scientific arguing back and forth. Most New Zealanders are aware that, due to government funding, scientists will put up vociferous arguments in favour of the governmental stance. That is my view from what I have observed. Yet nothing changes the fact that all New Zealanders have the right to water that has not been mass medicated, which enforces a population to take something they don’t want. As mentioned earlier, if it is illegal for doctors to prescribe mass medication, so it should be for the state. And the basic problem is dental hygiene in this instance, so the answer is to ensure children obtain proper dental hygiene. A free toothbrush and toothpaste and a brief tutorial at school for the at risk groups is all it would take. The data from Bashash et al has a high degree of scatter, & low explanatory power. Only 3% of IQ variation could be linked to fluoride levels, and standard errors are high; it’s not really possible to draw such strong conclusions from it. Its not the holy grail that you are claiming here. And while some of you may mock animal models, let’s remember that FAN is quite fond of Luke et al’s work on gerbils. Can’t have it both ways. “Since 2012 there have been another twenty odd published human studies, making a total of 53 out of 60 that show harm to the brain.” – These would be the studies from countries where natural levels of fluoride are high, much higher than found in CWF? Studies where villages with F- levels similar to CWF were used as controls? And which thus don’t support your case? Yes we need human clinical placebo based testing if the earlier ones aren’t acceptable to promoters of fluoride. Population studies and animal studies will always result in arguments and counter arguments. Alison you said ” These would be the studies from countries where natural levels of fluoride are high, much higher than found in CWF? ” I did a fact check and here is the truth as follows. Enforced mass medication through the water supply of a country is a complete violation of the basic human rights of an individual. It is more the action of a fascist state than a democracy as it leaves the individual with no choice. Water is sacrosanct. It is a taonga and as New Zealanders we have an obligation to keep all pollutants out of the water and to ensure it remains clean. This sort of thing is usually to encourage members of a clique to ‘bomb’ the linked site by setting up a (usually straw-man) view their members should ‘rail’ against. 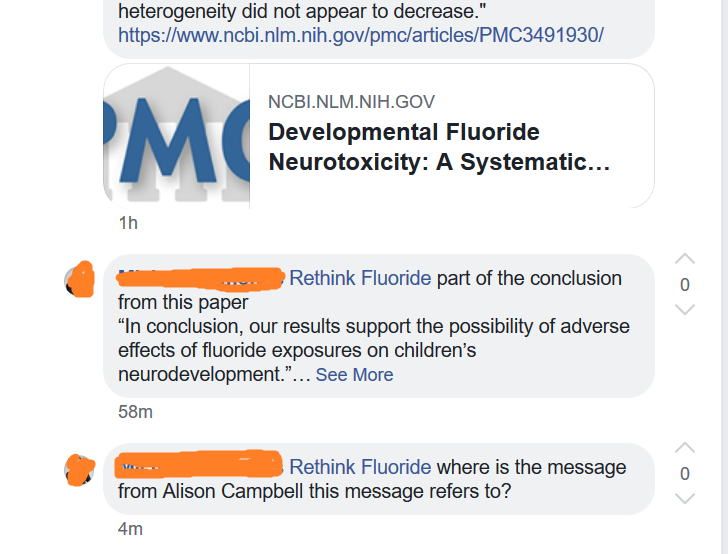 Most readers won’t read what Alison has written, but will write based on what Rethink Fluoride has written. I’d encourage people visiting here to actually read the points Alison makes. They’re rather different to what RF has lead their link to this piece with! Gus says, “Case Reports of Hypersensitivity to Ingested Fluorides:” and then provides a link to “fluoridealert,” an organization that takes money from organizations which routinely receive warning letters from the FDA for unethical behavior. Because the more paranoia that “fluoridealert” can generate, the more junk alternative health pushers can sell. By the way, Gus, got anything from less than 50 years ago? 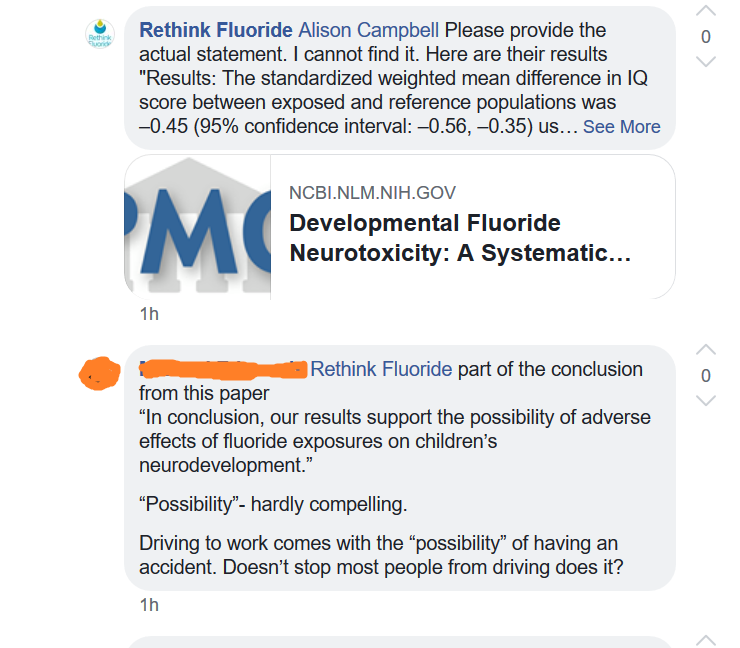 So is Alison conceding that the Choi meta-analysis doesn’t say what she originally said on the Rethink fluoride facebook page, which was something along the lines of “the authors said the results may not be significant”? As stated above the authors said “The estimated decrease in average IQ associated with fluoride exposure based on our analysis may seem small and may be within the measurement error of IQ testing. However, as research on other neurotoxicants has shown, a shift to the left of IQ distributions in a population will have substantial impacts, especially among those in the high and low ranges of the IQ distribution (Bellinger 2007).” So, in fact, they were saying the opposite. They were saying that some people might think this is small but it is not and even if it comes within a measurement of error, it is a very serious finding. This is no way alleviates the Gluckman report from having an incorrect and misleading conclusion that 7 IQ points is of no functional significance. Gus has also shown Alison to be wrong when she said that most of those studies were on populations with higher levels of fluoride in their water than we have. Alison does not understand the Bashash study and why the authors, who have published 50 other studies on neurotoxicity between them, concluded that it was a good study and was relevant to the US , which of course means it’s relevant to us. The study was published in the US Government’s peer reviewed journal Environmental Health Perspectives. The reason there is a large amount of scatter is because genetics is the biggest determinant of IQ. Genetics explains 80% of a child’s IQ. The authors are then looking for the other 20% and found they can explain 3% of the difference by fluoride intake. This may seem small but it is not. For every 0.5mg/L increase in maternal IQ there is a subsequent drop of 2 -3 IQ points in their offspring. New Zealanders have the same level of fluoride in their urine, and fluoridation increases the amount of fluoride a person consumes. According to a recent abstract from Canada the fluoride urine of pregnant women in fluoridated areas is twice as high as those in non-fluoridated areas, and the pregnant women in the fluoridated areas, had the same level of fluoride in their urine as the women in Mexico. Therefore, a child born to highly intelligent parents will still be intelligent, but just not as intelligent as they would have been. Instead of having an IQ of 140 they have an IQ of 135, still a high IQ. And children born to less intelligent parents in nonfluoridated areas will still be less intelligent. To use “scatter” as a reason to dismiss Bashash shows a lack of understanding. However, this whole issue could be solved if we had a compromise. People who want fluoride can brush their teeth with a fluoride toothpaste. If they want to swallow fluoride they can eat some of their toothpaste, or they can buy fluoride tablets (neither recommended by MoH) or they can drink a cup of tea. If they want children to have fluoride on their teeth, they can advocate for public education, maybe school tooth brushing schemes and free toothpaste and tooth brushes since forcing a medical treatment onto other people without their informed consent is morally wrong and is a criminal act in any other non life threatening situation. If it falls within the margin of error for testing IQ, then it does – as was explained to you elsewhere. So no, I am not conceding anything. Well, no, I wasn’t, because the actual papers include details on the actual fluoride concentrations. Re fluoride in the urine (one of Gus’s concerns) – it’s around 2.-4 mg/L. According to the Mayo Clinic normal high-end fluoride concentrations in blood plasma are around 4 micromol/L, or 0.076mg/L The difference between urinary & plasma concentrations suggests that the kidneys are doing their job of producing concentrated urine. Dave please provide details of more recent placebo challenge testing of individual of side effects. Good luck with that. Also provide the clinical safety studies they did prior to starting fluoridation. Also good luck with that. Dave also tries to shoot the messenger. Alison is still saying she isn’t wrong about fluoride levels even when I posted the true facts. Unbelievable. For all the anti- fluoride people posting here please observe how Alison hasn’t deleted any of your posts unlike whoever runs your fluoride free site. Perhaps you could learn something from this. Alison you have the patience of a saint. To all of the rethink fluoride posters here I think it is important you remember this is not your usual echo chamber. Here trying to use a paper for support that states that results “may be within the measurement error of IQ testing” is not going to get the applause of people who don’t understand science – it is more likely to result in eye rolling from those who do. Similarly accusing others of cognitive dissonance while being blissfully aware of your own, isn’t impressive. Or suggesting people are using “false analogies” when they are actually quite reasonable analogies. Or pulling out exceptions such as thalidomide while ignoring the many cases where animal models do work. Suggesting Alison is slurring others by describing how had her posts deleted, while conveniently overlooking the insults and snide remarks used on many of the” fluoride free” related sites is at the very least hypocritical. Probably the only argument you have that is close to reasonable is the one about being mass medicated. If you are raised with good dental hygiene and access to dental care, good food etc you probably don’t need fluoride in the water. However, everyone does not have that privilege. To all the pro fluoride people posting here, please note that none of the people opposed to fluoride are forcing anything onto you and violating your rights. Deleting posts are a far cry from forcing people to drink a medication. And dont say it’s not forced as the NZ Supreme court have agreed it is medical treatment that is compulsory for anyone living or working in a fluoridated area. For anyone to justify that on the basis that they believe some people are not brushing their teeth shows how far their moral compass is out of whack and their respect for other peoples rights and beliefs is pretty much none existent. And to get back to the science (not that we should have to). Alison is misinterpreting what the authors were saying when they said “and may be within the measurement error of IQ testing”. This means that when testing an individual for IQ, the results will have a fairly wide measurement error. They are not saying the studies which look across whole populations do not provide evidence. In actual fact, the study provides strong evidence that fluoride reduces IQ. And the Bashash study completely confirms it. The Gluckman Report does have an incorrect and misleading conclusion. Anyone with any idea of what IQ means, knows that a reduction of 7 IQ points across a population will have serious effects. A drop of 5 IQ points across a population will halve the number of geniuses and increase by 50% the number of mentally impaired. It’s just ridiculous to say a loss of 7 IQ points is “of no functional significance”. Many of the Chinese studies in the Choi meta analysis do have higher concentrations of fluoride in their water but their populations are probably not consuming more fluoride as the babies were mostly breast fed in these villages (a baby bottle fed with fluoridated water receives over 150 times more fluoride than a breast fed baby), nor were they using fluoride toothpaste or having fluoride varnishes. It is amazing that people are still referring to concentration in the water as if that is the same thing as dosage. And I don’t know where you came up with fluoride in the urine at around 2.-4 mg/L. The Bashash study had fluoride levels in urine at 0.82 (0.64, 1.07) mg/L urine F. The Brough study from Palmerston North NZ found a median concentration of 0.82 (0.62, 1.03) mg/L urine F. And the latest study presented at the Ottawa conference a couple of weeks ago found 0.86 ± 0.34 in pregnant women in fluoridated areas in Canada. Where did I get my figures from, re fluoride in the urine? I did my maths; read the explanation. Fluoride in the urine is a poor approximation for [fluoride] in the blood plasma: urinary concentrations are always much higher, & are affected by a range of factors, including hydration, temperature, & exercise, as well as diet. As for the Chinese studies – I see some special pleading going on. And I will note the irony again: on its FB page, FFNZ has agreed with Martyn Bradbury that we need discussion across the ‘boundaries’, and here you are, freely commenting on my blog – while Rethink Fluoride has blocked me from doing the same. Alison what are your margin of safety calculations? It’s a straightforward calculation converting the concentration of fluoride in blood plasma (as cited by the Mayo Clinic) from micromol/L to mg/L. Why do you expect a simple conversion calculation to have a ‘margin of safety’? Sorry I was actually referring to how much below the level found to cause adverse effects is a safe level. So if adverse effects are found at 1 ppm fluoride ion in a study then what concentration would be safe for the population of a whole country? Just had a look at one of the rethink fluoride posts and it looks like they have deleted posts by both Alison and Ken. It certainly doesn’t help anyone make sense of the comments as people are making comments against posts that no longer exist. Sad they they ban people purely because they are afraid people will see that science does support the claims of those against fluoride.